My Instant Pot sat in its box for a couple weeks before I pulled it out and looked at the recipe book. Since then, I’ve been looking up recipes on Pinterest, trying to adapt my own recipes, and testing all the functions of the pot. And I have to say there’s a reason everyone has been raving about this electric pressure cooker! 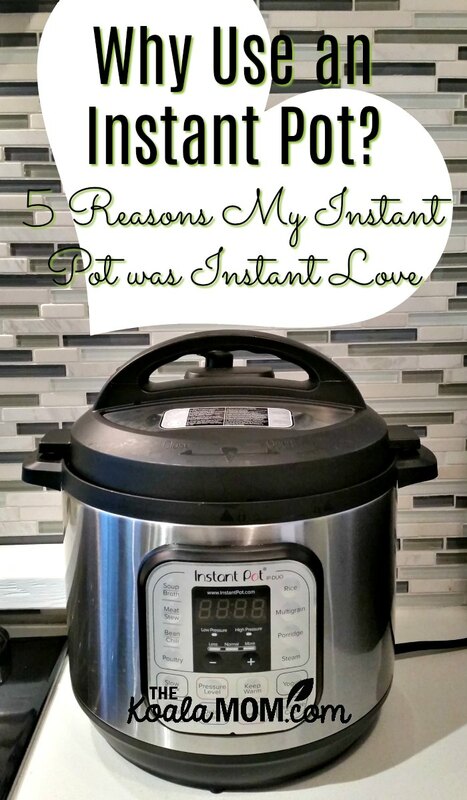 I am head over heels in love with my Instant Pot and use it nearly daily. This post contains affiliate links; as an Amazon associate, I earn from qualifying purchases. I received my Instant Pot as a Christmas gift;all opinions expressed are my own. Here’s why my Instant Pot has been instant love, and why you should use an Instant Pot too. I’ve never had a rice cooker because I didn’t see why I’d buy a special appliance to do that when I could just use a pot. I donated my crock pot immediately after opening my Instant Pot. If you only use your multicooker to replace your crock pot, you’ll still be happy with it! I love the stainless steel insert in the Instant Pot much better than the huge, hard-to-clean ceramic insert in my crock pot. I also find the settings on the front of the multicooker easier to control than my slow cooker. And the timer is handy too. I’ve never had a pressure cooker because my mom only used it for canning. While I enjoy home canning, pressure canning seemed much more complicated. I would have never tried cooking in a traditional pressure cooker. A friend in my mom’s group told us about doing this. She said she used her stovetop pressure cooker on a regular basis for soups and stews for her family, as it was quick and delicious. Like many others, however, I worried about the accidents I’d heard about. The safety mechanisms of the Instant Pot make it a worry-free way to get the same cooking results our grandmas did. I’d never made yogourt myself because Mom did that too, but it was a long, finicky process that involved wrapping a towel around a tub of boiled milk and leaving it to sit in a warm oven overnight. The Instant Pot makes yogourt easy because everything happens in the pot. I don’t have to worry about watching the temperature as the Instant Pot does that for me (except for the cooling process). I’ve also used my Instant Pot for baking! It makes delicious lava cakes, apple crisp and a rich, fudgy chocolate cake. As one person pointed out, it’s a great alternative to turning on your oven on a hot summer day. The Instant Pot doesn’t heat up the whole house the way an oven would. I’ll admit that when I first pulled my pot out of its box, and looked at all the buttons on the front and the glossy pages of the instruction manual, I thought about putting it back in the box. It takes time to learn to use a new kitchen appliance, and the Instant Pot is no different. Give yourself the time! Sit down with a cup of coffee and the instruction book and read it. Follow the instructions for beginners. (A good way to start is by boiling water in your new pressure cooker.) Then read the recipe book included and pick something easy and interesting to try. My first recipe in the multicooker was a mini lava cake. It was easy to mix up (like the brownie-in-a-mug recipe I haven’t made since we got rid of our microwave!) and cooked to gooey goodness in ten minutes. We now make mini lava cakes on a regular basis. My girls like lava cakes too, so I end up mixing lava cakes in four mugs and fitting them all into my pot like a puzzle! Yes, I know it’s called an Instant Pot, but it’s not a microwave. I’ll admit I was disappointed when I looked at a few Instant Pot recipes that had cooking times of an hour and a half or more. It also takes time for the pot to get to pressure (about five to ten minutes, depending on what’s inside the pot) before it begins cooking. Once you know this about the pressure cooker, however, it’s still easier and faster than other ways of cooking. Think about foods you might not make because you’d have to spend hours cooking them. Beans. Ribs. Beets. Those are the foods that you will want to make with your Instant Pot, because now they can be done in less time. One of my favourite meals in the multicooker has been barley beef stew (which I’ve never tried making before because it seemed like barley took so long to cook). My friends also rave about making spaghetti sauce (it’s always better if you can let it simmer longer, but the Instant Pot gives you the flavour without the simmering!) and ribs (which I’ve only ever made in my crock pot because otherwise they’re tough). Boiling eggs and boiling pasta can be done in about half the time in the Instant Pot. It may not seem like much to make pasta in five minutes instead of ten, but believe me—when the kids are hangry and need food fast, that five minutes make a difference! When I realized how the Instant Pot was helping me save money on my grocery bill, I was even more excited. Not only does it make cooking quicker and easier, it also helps me stick to a small budget for groceries! In the past, I’ve heard that buying dried beans would be cheaper than canned beans—but I didn’t want the work involved. Now, I’m trying to use up my canned beans so I can stock up on dried beans. Not only are they cheaper to buy, they taste waaaay better when made in the Instant Pot! Yogurt was an item on my “luxury” list that I only bought for special occasions or if it was on sale for a really good deal. Now, we eat yogurt regularly. I can buy a gallon of milk for just under $5 and make a big tub of yogurt that would cost me over $12 on sale. Realize also that time is money. If the Instant Pot is saving you time, then it’s also saving you money. I like to use the slow cooker or delay start features to plan meals for busy days, like when we’re out for music lessons right before supper hour or heading up to the ski hill for the afternoon. When I know we’re coming home to a hot, delicious meal in the Instant Pot, then we’re less likely to stop for fast food or even to grab processed foods like frozen pizzas at the grocery store. Have I mentioned flavour yet? Pressure cooking seals more flavour into the food you’re cooking. I noticed this first when I made chickpeas. My sister-in-law said one of her favourite meals to make was hummus because the chickpeas were so smooth and creamy in the Instant Pot. I have to agree with her! I couldn’t believe the difference between canned chickpeas and dried chickpeas which I’d pressure cooked. The Instant Pot is also helping me cook healthier meals for our family. Buying dried beans instead of canned is not only cheaper and yummier, it’s also lower in sodium. I’ve been making my own broth (and using chickpea broth for soup recipes!) in my Instant Pot. And with the Instant Pot, it’s easier to make low-carb meals that feature more beans and vegetables and less pasta. You can even find keto instant pot recipes for your pressure cooker! Have you tried using an Instant Pot? What do you love about it?